The current debate on the connection between CO2 emissions and climate change has largely overlooked an independent and equally serious problem, the increasing acidity of our oceans. 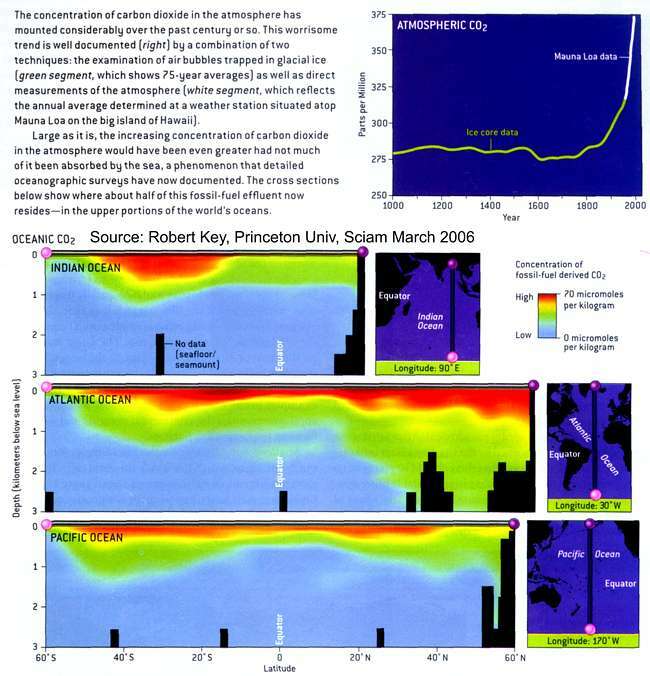 Last December, the respected journal “Oceanography” published projections (see graphic below) for this rising acidity, measured by falling pH [i], through to the end of the century [ii]. The current debate on the connection between CO2 emissions and climate change has largely overlooked an independent and equally serious problem, the increasing acidity of our oceans. Last December, the respected journal “Oceanography” published projections (see graphic below) for this rising acidity, measured by falling pH [i], through to the end of the century [ii]. 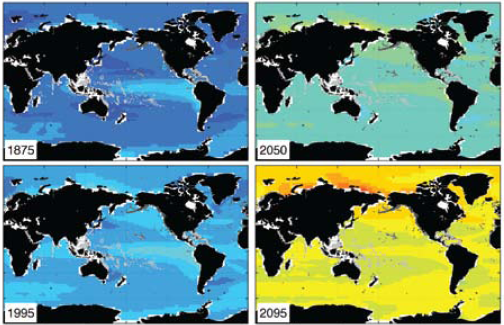 In 2095, the projected average ocean surface pH is 7.8, and lower still in the Arctic Ocean. Fig 1: Ocean surface pH - historical values and projected future values based on current emission projections. CO2 in the atmosphere has increased from 278 ppm in pre-industrial times to 390 ppm today. During this time, the amount of CO2 dissolved in the ocean has risen by more than 30% [iii], decreasing the pH of the ocean by 0.11 units. As with CO2 and global warming, there is some lag between cause and effect. That means that, even if all carbon emissions stopped today, we are committed to a further drop of up to 0.1 units. 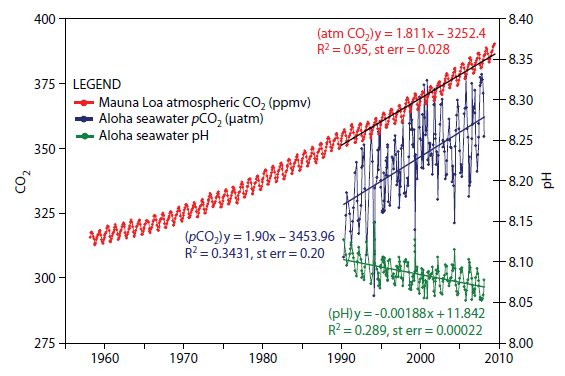 Fig 2: Annual variations in atmospheric CO2, oceanic CO2, and ocean surface pH. Strong trend lines for rising CO2 and falling pH. CO2 dissolves in waterto form carbonic acid. (It is worth noting that carbonic acid is what eats out limestone caves from our mountains.) In the oceans, carbonic acid releases hydrogen ions (H+), reducing pH, and bicarbonate ions (HCO3-). The additional hydrogen ions released by carbonic acid bind to carbonate ions (CO32-), forming additional HCO3-. This reduces the concentration of CO32-, making it harder for marine creatures to take up CO32- to form the calcium carbonate needed to build their exoskeletons. The two main forms of calcium carbonate used by marine creatures are calcite and aragonite. Decreasing the amount of carbonate ions in the water makes conditions more difficult for both calcite users (phytoplankton, foraminifera and coccolithophore algae), and aragonite users (corals, shellfish, pteropods and heteropods). The photo below left shows healthy specimens of calcifying phytoplankton Gephyrocapsa oceanica. The photo below right shows the damage to the same creature under conditions expected by the end of the century. Fig 3: Healthy phytoplankton; same species with malformed shell plates as a result of damage by seawater with simulated end of century chemistry. It is often said that a picture is worth a thousand words. Research in the Southern Ocean provides evidence that the formation of foraminifera shells is already being affected. Even though these creatures use calcite, which is less soluble than aragonite, there are already clear signs of physical damage. According to Dr. Will Howard of the Antarctic Climate and Ecosystems Cooperative Research Centre in Hobart, shells of one species of foraminifera (Globigerina bulloides) are 30 to 35 percent thinner than shells formed prior to the industrial period.[vi]. The photo below left shows a pre-industrial exoskeleton of this species obtained from sea-floor sediment. The photo below right shows a exoskeleton of a live specimen of the same species obtained from the water column in the same area in 2007. These stunning images were obtained using an electron microscope. (An interview with Dr. Howard was broadcast on the Catalyst television program). [vii] What is staggering is the amount of erosion in the right image compared to the left. 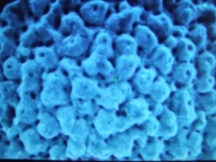 The right sample look porous with larger holes and a 10-fold increase in their number. These and creatures like them are at the base of an ocean food chain, and they are already seriously damaged. If they are lost, it is not just biodiversity we are losing, but our food supply as well. Fig 4. Pre-industrial and current samples of Globigerina bulloides from same location. Latter shows extensive erosion with a ten-fold increase in holes. The implications of all of this are disturbing. For corals to absorb aragonite from seawater, the latter needs to be saturated in this mineral. Now a report from NOAA scientists found large quantities of water undersaturated in aragoniteare already upwelling close to the Pacific continental shelf from Vancouver to northern California [v]. Although the study only dealt with the area, the authors suggest that other shelf areas may be experiencing similar effects. For corals like those in Australia’s Great Barrier Reef, the outlook is grim. They are threatened with destruction on two fronts, both caused by CO2 emissions. Not only do increased ocean temperatures bleach coral by forcing them to expel the algae which supplies them with energy (see photo at left) [viii], but increased ocean CO2 reduces the availability of aragonite from which reefs are made. Fig 5. Coral killed by above average ocean temperatures. [i] pH is a measure of the acidity or alkalinity of a solution. It uses a negative logarithmic scale where a decrease of 1.0 units represents a 10-fold increase in acidity. In their natural state prior to industrialization, the oceans were slightly alkaline with a pH of 8.2 (see reference iii). Pure water has a pH of 7.0. [iv] Feely, Doney and Cooley, op. cit, using Mauna Loa data from the US National Oceanic and Atmospheric Administration and Aloha data from the University of Hawaii. It's well worth listening from beginning to end! "Past history shows us that when CO2 rose sharply, this corresponded with mass extinctions of coral reefs." The mass extinction events you refer to- End Permian, PTEM, End Triassic- occured over tens of thousands to millions of years, at a rate not relevant to human time frames. Corals went extinct, and ocean acidity rose, but it did not rise 'sharply'. We should equally start worrying about continental drift rates and extinction. Past history also shows us that when continents collided, numerous species went extinct, but at a rate not relevant to humans. "The change in seawater pH over the 21st Century is projected to be faster than anytime over the last 800,000 years and will create conditions not seen on Earth for at least 40 million years." This is entirely based on model projections, which are themselves based on dubious assumptions. Past pH in industrial times has been modelled, not measured, therefore the current rate of change in oceanic pH is itself doubtful. A recent paper which measured pH in the last 15 years in the north pacific shows it has experienced an average change of 0.03pH in the last 15 years. I'm not sure this is a rate to which there is concern. The geological record indicates that oceans appear to be strongly buffered, and do not change pH easily. They have apparently not changed pH more than 0.6 in the last 300 M years, presumably because of negative feedbacks/buffering to any rise in C02/other factors. Hundreds of thousands of years of widespread explosive volcanism is generally required to lead to a modest rise in oceanic acidity. I would suggest that most of the research papers on potential ocean acidification are written by biologists and chemists who do not take into account processes outside their own, specialist fields. An illustrative example is, for eg, the question of where all the water in the oceans themselves originally comes from. If you ask some NASA scientists, it comes from comets. These scientists have, incidentally, never studied effects of large cooling magmas in the earth's crust. When granitic magmas cool, they expel water; the Earth's cooling crust in its early history is more than enough to account for all the world's ocean water, a process that still goes on today in eg mountain ranges, although the net water balance of the planet is more or less constant due to water saturated crust also being subducted into subduction zones. The point is, the comets, which are the NASA scientists special field, have nothing to do with the origin of the vastly greater portion of the world's water. The subsurface, and its processes, as usual, are presumed to be stable and unchanging, and therefore ignored. Another illustrative example is when geologists first reported the presence of numerous species of microrganisms feeding on 'dead' rock masses thousands of metres below the surface-these findings were initially totally ignored-how could deep subsurface 'rocks' be relevant to Earth's Biological processes? Now some scientists think that life itself may have originated deep within the earth, from/in association with these deep-dwelling micro-organisms (eg Paul Davies). Also of note, is that these micro-organisms are believed to account for by far the greater mass by weight of biota on earth, they extend well into the earth's crust, and are ore or less everywhere/abundant. Much the same sort of ignorance goes for various ocean acidification theories/projections; buffering procesess in the subsurface, for eg the >100,000km of Mid Oceanic Rifts, which extend down several kilometres of heated, carbonate-enriched rock, where large amounts of carbonic acid are produced/exchanged/ precipitated in the subsurface, are generally totally ignored by biologists and chemists, who think all you have to do to prove ocean acidification is carry out an experiment in a controlled lab with some H20, gases and no real-world earth subsurface processes, ie if you add c02 to the atmosphere, then oceans will experience runaway acidification. Their field and their models do not take into account rates of chemical precipitation /dissolution of eg c02 in the world's subsurface,rates of oceanic mixing, microbiological feedbacks, or any other potential buffering/negative feedback effects, nor the long geological record which indicates that the oceans only change pH significantly on geological timescales, not human timescales. The idea that oceans will acidify markedly over the next century is a result of inaccurate and incomplete modelling, nothing more. "A recent paper which measured pH in the last 15 years in the north pacific shows it has experienced an average change of 0.03pH in the last 15 years. I'm not sure this is a rate to which there is concern." "The geological record indicates that oceans appear to be strongly buffered, and do not change pH easily. They have apparently not changed pH more than 0.6 in the last 300 M years"
Minus 0.003 pH per year would yield an decrease of 0.6 pH in a mere 300 years, not 300 million - to me, this rate of change really is matter for concern. Now, to be fair you didn't claim pH dropped by 0.6 over 300My, but rather that this was the extent of the variation (which in itself is meaningless when talking about the rate of change). Fortunately, we can take a look at the CO2 vs. pH graph above to have an idea of the rate at which acidification can take place outside of human intervention. Looking at the last drop of 0.2 in the pH, we can see it took place quite rapidly, but not any quicker than about 2,000 years (there is 20ky per tick on that graph). This is a rate of 0.0001 pH per year, or about 50x slower than the current decrease in pH. Is there a way to read Pelejero 2010 w/o buying a membership with Science Direct? If not, this page would be improved by a summary of the proxies used and how they were validated. The first deep basin observations of Aragonite undersaturation in surface waters have already been observed in 2008 in the Arctic (Yamamoto-Kawai 2009), and in 2009 the extent of surface waters with undersaturated aragonite increased, although this is not yet region-wide. This means that these waters crossed the threshold where they are beginning to be corrosive to certain types of calcifying organisms. The trends in the Arctic regions have been a cause for concern for some time (Bates 2009), as the Arctic waters are subjected to the dual effects of decreasing alkalinity due to increasing pCO2 (directly due to uptake of the increasing atmospheric CO2 due to anthropogenic emissions), and increased sea ice meltwater due to increases in regional temperatures which are greater than the average global temperature rise. Models also predicted Aragonite undersaturation in these regions would occur in the near future, but the recent increased rate of ice melt has accelerated the process (eg Steinacher 2009). As both atmospheric CO2 and Arctic sea ice melt rates are on accelerating trends this will have a negative effect on populations of both planktonic and benthic calcifying organisms in the Canada Basin, and potentially over wider areas within a relatively short time span. A key finding of theirs is that large but slow pCO2 changes led to somewhat smaller final ocean pH response, thanks to geologic-scale "buffering" effects (top 1/4 of their figure 1(b)). However, over shorter time spans, "[w]hen a CO2 change occurs over a short time interval (that is, less than about 104 yr), ocean pH is relatively sensitive to added CO2"
So, just how sensitive, I wondered? I tried to glean from their graph whether ocean pH response to changes in pCO2(atm) is basically linear or logarithmic (they don't state either way). The X axis of figure 1(b) is log (or semi-log?) while the vertical bands for each pH level are spaced about equally, suggesting a logarithmic relationship. If so, the response for a doubling of CO2 along the bottom of fig. 1(b) (i.e. over short, human-scale time spans relevant to ACC) looks like roughly 0.3 pH units per doubling of pCO2. I'd appreciate if others would review the article and see if my takeoffs make sense of what's there. Also, lately I'm seeing frequent repetitions of the argument that ocean pH is still > 7 and so it is not "acidic", and that somehow precludes or invalidates use of the term 'Acidification' for lowering pH (even though this is perfectly valid and common scientific usage). Do we need to define this as a new "skeptic argument", or at least include a direct refutation of that move under this "it isn't serious" topic? Jim Prall #7, you think the hysterics over 'acidification' are bad? I just had a 'skeptic' (who was cited in the Cuccinelli vs Mann case) very determinedly telling me that the oceans are NOT becoming more acidic. Rather, they are becoming less alkaline. I suppose I should just be thankful that they have some grasp on reality... even if they refuse to allow words to hold their traditional meanings. The problem is that any significant change in pH affects biological systems and the solubility of the basic building blocks like CaCO3. There is no magic threshold at pH = 7.0 other than a semantic one; for a biochemist, nothing special happens crossing that line. Changing pH from, e.g. 8.3 to 8.2 has a real, tangible effect on the solubility of CaC03, and on the equilibria between CO2(aq), H2CO3, and HCO3[-1]. These changes alter the "saturation horizon"--the depth at which CaCO3 is saturated, and that has a vital effect on organisms that form hard carbonate shells. There are ecological impacts to any substantial change in pH, whether the starting point is 8.3, 7.9, or 7.001. Arguing that lowering pH substantially "isn't acicification" is just debating semantics, and certainly walks and quacks like a diversion tactic. Jim, they probably aren't gardeners. Gardeners fully understand more and less acidic/alkaline in relation to soils. Though I think it would be pushing it to propose an analogy based on blue and pink hydrangea blooms. And yes. Acidification is the term used in the study. Like it, or not. Are they trying to measure coral growth the wrong way when they concentrate on calcium carbonate measurements? Would we not expect the ocean equivalents of plants to also grow more as the CO2 increases as well, providing more food for sea life? Plankton and algae will increase productivity as CO2 levels increase in seawater, they die, raining down on the sea floor, sinking more CO2. You're arguing a strawman there. Changes in seawater chemistry are anything but simple. No. Decreased carbonate concentrations in seawater, combined with acidification and ocean stratification affect the long-term viability of phytoplankton populations. "Here we combine available ocean transparency measurements and in situ chlorophyll observations to estimate the time dependence of phytoplankton biomass at local, regional and global scales since 1899. We observe declines in eight out of ten ocean regions, and estimate a global rate of decline of ~1% of the global median per year. Our analyses further reveal interannual to decadal phytoplankton fluctuations superimposed on long-term trends. Rob Painting: Did you read the paper I referenced, showing increased biomass in coral with increased CO2? Did you read the paper I referenced, showing increased plankton growth with increased CO2? Are you offering me any peer reviewed papers proving the opposite? No. Did you notice the paper I referenced, showing plankton growth limited by iron? "We conclude that Fe deficiency is limiting phytoplankton growth in these major-nutrient-rich waters." That paper also seems to show that mortality rates for some sea creatures, such as mollusks, increase with CO2. "Perhaps the most dramatic support for Martin's hypothesis was seen in the aftermath of the 1991 eruption of Mount Pinatubo in the Philippines. Environmental scientist Andrew Watson analyzed global data from that eruption and calculated that it deposited approximately 40,000 tons of iron dust into the oceans worldwide. This single fertilization event generated an easily observed global decline in atmospheric CO2 and a parallel pulsed increase in oxygen levels." You have so many misconceptions about the topic, it's difficult to know where to start. The advanced version of Ocean Acidification should be out by years end and hopefully that clears up some of your confusion. 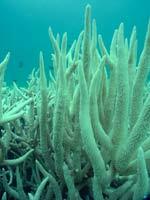 Coral reefs - long term monitoring is showing a rise in bleaching events and coral death. Both acidification and ocean warming negatively impact coral reefs. "Many reefs are dead or dying across the Indian Ocean and into the Coral Triangle following a bleaching event that extends from the Seychelles in the west to Sulawesi and the Philippines in the east and include reefs in Sri Lanka, Burma, Thailand, Malaysia, Singapore, and many sites in western and eastern Indonesia. Can ocean iron fertilization mitigate ocean acidification?
" Here, using a global ocean carbon cycle model, we performed idealized ocean iron fertilization simulations to place an upper bound on the effect of iron fertilization on atmospheric CO2 and ocean acidification. Under the IPCC A2 CO2 emission scenario, at year 2100 the model simulates an atmospheric CO2 concentration of 965 ppm with the mean surface ocean pH 0.44 units less than its pre-industrial value of 8.18. A globally sustained ocean iron fertilization could not diminish CO2 concentrations below 833 ppm or reduce the mean surface ocean pH change to less than 0.38 units. This maximum of 0.06 unit mitigation in surface pH change by the end of this century is achieved at the cost of storing more anthropogenic CO2 in the ocean interior, furthering acidifying the deepocean. If the amount of net carbon storage in the deep ocean by iron fertilization produces an equivalent amount of emission credits, ocean iron fertilization further acidifies the deep ocean without conferring any chemical benefit to the surface ocean"
The bleaching of coral reefs seems to actually be caused by fungus, which is transported across oceans by dust in the wind as the climate naturally warms and dries. Chris , I find it insightful to actually read the studies linked to. The authors are proposing a hypothesis (back in 2000). They claim that two bleaching events in the Caribbean (1983/1987) coincide with increases in dust transport into the region. They lay the foundations for their hypothesis, that's the extent of it. In those two years (1983/1987) anomalously warm waters occurred too. Furthermore 1988 was a year of Caribbean coral bleaching and according the graph in Shinn 2000, this was a year of very low dust import into the region. In the meantime, coral reefs the world over have begun to bleach, as sea surface temperatures rise (see links at @ 19 for instance). I would certainly be interested to see how the authors of that study explain that away on African dust. And yes, coral diseases are a major problem, often after bleaching events have occurred. I searched for, found, and read that paper after watching an educational TV program that covered the fungus, possibly a Nova? It says, "Bleaching occurs when the conditions necessary to sustain the coral's zooxanthellae cannot be maintained. Any environmental trigger that affects the coral's ability to supply the zooxanthellae with nutrients for photosynthesis (carbon dioxide, ammonium) will lead to the zooxanthellae's expulsion.". That seems to say that CO2 is required for photosynthesis. How much stock am I supposed to put in the 'acidification' mention when CO2 appears to be essential for coral photosynthesis? "African Dust Poses Threat to Coral Reefs and Human Health: Contaminants carried with African dust to the Caribbean and the Americas may be a threat to marine organisms and humans, according to preliminary results of a new study by researchers with the U.S. Geological Survey, Oregon State University, and the University of the West Indies. The scientists compared contaminant levels in sources of African dust and downwind regions. Of the more than 100 persistent organic pollutants screened for in the samples, including banned and common-use pesticides, six pesticides (chlorpyrifos, dacthal, endosulfans, hexachlorobenzene, chlordane, and trifluralin) were detected in samples from all sites. Concentrations were significantly higher in Mali. DDE (a breakdown product of DDT) was also identified in Mali, U.S. Virgin Islands, and Trinidad samples. To date, DDT and carcinogenic dioxins and furans have been detected only in samples from Mali. Many of the identified contaminants are thought to be toxic to corals and other marine organisms and can interfere with reproduction, fertilization, or immune function. For more information, contact Virginia Garrison at 727-803-8747, ext. 3061 or ginger_garrison@usgs.gov." "The Origin of Aspergillus Sydowii, a Common Disease of Caribbean Corals: Coral reefs are increasingly suffering outbreaks of disease, causing dramatic declines in population abundance and diversity. One of the best-characterized coral diseases is aspergillosis, caused by the fungus Aspergillus sydowii. A. sydowii is a globally distributed fungus commonly found in soil, so its presence in marine systems raises questions about its origin. By using microsatellite markers, researchers analyzed the population structure of A. sydowii from diseased sea fans, diseased humans and environmental sources worldwide. The results indicate that A. sydowii forms a single global population, with low to moderate genetic differences between the disease found in sea fans and the same fungus from environmental sources. Past researchers have suggested that A. sydowii originates from African dust blown into the Caribbean, and have identified Aspergillus from dust samples, although often only to the genus level. To test this, researchers isolated fungi from dust samples collected in Mali and St. Croix. Although a diversity of fungi was documented from African dust, including seven species of Aspergillus, none of the samples contained A. sydowii. Taken in conjunction with recent molecular evidence suggesting lack of a single point source of the fungus, this research suggests that there are likely multiple sources and introductions of this pathogen into marine systems. For more information contact Krystal Rypien at 858-534-3196, krypien@ucsd.edu or Virginia Garrison at 727-803-8747, ext. 3061 or ginger_garrison@usgs.gov." "The Emperor Has No Coral? Results of research on coral reefs in the Florida Keys reef challenge the highly popular notion that present declines in reefs in Florida and elsewhere are related to human activities. High-resolution sub-bottom profiling, reef drilling, and mapping of benthic habitats along the reef tract present a paradox in coral growth patterns: reefs that are dead or dying -- and therefore not building -- outnumber live and building reefs about 100 to 1. Yet growth rates of all common coral reef species should have kept pace with the well-documented rise in sea level over the past 6,000 years. Why did so few reefs keep pace or build up with the rise in the present sea level? Geological history may provide an answer: two 500-year periods of non-growth of coral reefs occurred in the region 4.5 thousand years ago and 3,000 years ago. These periods of non-growth indicate times of environmental crises that predated modern human presence in the Florida Keys. The present period of rapid coral demise has spanned only about 30 years. For more information, contact Eugene Shinn at 727-533-1158, eshinn@marine.usf.edu or Barbara Lidz at 727-803-8747, ext. 3031, blidz@usgs.gov." Not really. Coral reef bleaching can be induced by a number of conditions- as listed in the Wiki page. The bleaching events I have previously linked to are truly massive in scale and correspond with anomalously warm, and sustained, sea surface temperatures. Hence the ability to predict these large bleaching events in advance. If you pore over the peer-reviewed literature you will see a lot of debate about the cause in earlier years, however as global warming, and warming ocean temperatures have continued, the evidence identifying warming SST's has strengthened. Try reading the first link I provided at @ 19. The lead author, Eakin, has published a lot of work on corals, and the study gives a good overview. Yes, same for "sea plants" as it is for land based ones. The carbon in the CO2 molecule provides the basis for carbohydrates which are synthesized using energy from the sun. #24: "Coral bleaching is a vivid sign of corals responding to stress,"
c. starvation caused by a decline in zooplankton -- do they die due to lowered pH? "CO2 appears to be essential for coral photosynthesis?" Corals are Cnidaria ... (animals). We don't do photosynthesis. Muoncounter: you might want to read replies from Rob Painting. Coral is a symbiotic organism, basically an algae inside the animal. The algae provides energy for the coral from photosynthesis. I remain curious as to why coral are so temperature sensitive, considering that they have evolved during millions of years of the glacial cycle? As of 1950, we were still 4.5C short of the temperature high achieved during the previous warming phase. The glacial cycle causes large climate changes. Why have coral not evolved to be more flexible about temperature? Muoncounter - We don't do photosynthesis. The corals in shallow water reefs are a symbiosis between the coral polyp and photosynthesizing algae. The algae provide nutrients to the polyp via photosynthesis and in exchange get shelter and protection. Typically too warm waters (above the photo-symbiont's tolerance) leads to a shut down in photosynthesis and because they are no longer getting food, the polyps expel the algae, hence the "bleaching" of colours which the algae produce. So although the polyp may not photosynthesize, it is certainly dependent on it for survival. Chris, were the Earth (and sea temperatures) not warming so rapidly, it's likely that coral would be able to adapt, by acquiring less temperature sensitive photo-symbionts. Like other changes in the Earth system, it's the speed of change that is the problem. I've been reading about dramatic temperature changes in the recent past, documented from temperature proxy data retrieved from the ice cores. "Following this abrupt shift, as much as 20 degrees Fahrenheit (10 degrees Celsius) of warming occurred over the subsequent decades—a change that ultimately resulted in at least 33 feet (10 meters) of sea-level rise as the ice melted on Greenland." "The ice core showed the Northern Hemisphere briefly emerged from the last ice age some 14,700 years ago with a 22-degree-Fahrenheit spike in just 50 years, then plunged back into icy conditions before abruptly warming again about 11,700 years ago. Startlingly, the Greenland ice core evidence showed that a massive "reorganization" of atmospheric circulation in the Northern Hemisphere coincided with each temperature spurt, with each reorganization taking just one or two years, said the study authors." These seem like pretty massive and rapid climate changes to me. Response: This discussion has drifted off the topic of this thread. Everybody please start commenting on the appropriate threads. I responds to this over on #148 of "we're heading into an ice age". scaddenp: I put the sources detailing recent dramatic temperature shifts here, because we're talking about the inability of coral to deal with dramatic temperature shifts. It seemed surprising to me. Indeed, they would affect any coral reefs growing around Greenland. I'm not aware there was, but if there was. Moderator: There isn't a coral rebuttal or post (yet). I didn't realize all those coral "arguments" existed. The changes in tropical temperatures during the glacial/inter-glacials was much smaller than the global average, "probably" 1-2 degrees change. Most of the large temperature swings occurred at high latitudes and especially the Northern Hemisphere where continental ice sheets formed. This small change is temperature in the tropics is why the tropical rainforests were not greatly affected by the ice ages. Precessional changes (wobbles in the Earth's rotation) which affect the amount of solar radiation at the equator are thought to have had a greater significance. Localized coral bleaching is not a new phenomenon, however mass coral bleaching is, certainly within the last several hundred thousand years. Do we have good temperature proxy data from the tropics? Sea floor cores, or such? Do the glacial cycles show up there, too? Follow up from here. Excellent link posted by RSVP. Odd, the largest changes in the Atlantic are in the northern hemisphere, the Indian is worse in the south, but the Pacific seems even. Response: I take back the 'excellent link' opinion. The website has an extensive page in denial of AGW. I'm not understanding this ocean acidifying-ocean CO2 feedback question. The SRES pathways considered here produce global surface pH reductions of about 0.3 to 0.5 pH units by year 2100. ... Atmospheric emissions of 5000 Pg C and 20,000 Pg C produce global surface pH reductions of 0.8 and 1.4 pH units, respectively by year 2300. 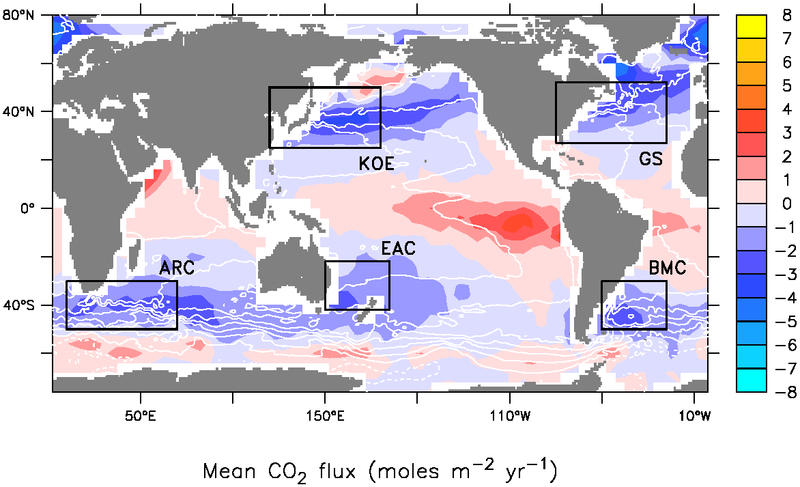 How is it possible for oceans to simultaneously absorb and emit CO2? Coming in from the cool ice data thread. Three factors of ten is ten times ten times ten or one thousand times different. The pH affects the different ion distribution as Stephen Baines points out. The pH in fresh water with CO2 dissolved is around 5 and the pH in the ocean is around 8 or 1000 times less hydrogen ions. This affects the carbonate concentration and therefore the solution of CO2. N2 and O2 are not pH sensitive. That is part of why Henry's law seems to not work according to your calculations. CO2 running out: stop speculating about processes you do not understand. We better pray that the CO2 in the ocean never outgasses enough to run out. There is an enormous amount of CO2 in the ocean and the surrounding land would start to dissolve as the CO2 outgasses. That would be Venus for sure. @ muoncounter. "I'm not understanding this ocean acidifying-ocean CO2 feedback question." As I understand it RSVP is claiming (incorrectly) that there can be no CO2 oceanic solubility feedback during northern latitude warming phases of Milenkovitch cycles because outgassing from warming oceans would have resulted in similar relative increases in CO2, N2 and O2. Summing up succinctly, RSVP fails to understand that the pool of exchangeable CO2 in the ocean is very large relative to that in the atmosphere (for a number of reasons), while the opposite is true for N2 and O2. As a consequence, outgassing from a warmer ocean affects atmospheric CO2 concentrations significantly, but it does not affect N2 and O2 concentrations in any measureable way. As far as I can tell, pH only comes into the discussion because of its effect on the relative abundance of carbonic acid, bicarbonate and carbonate ions (and protons) as temp changes the solubilty of CO2. #42: "outgassing from a warmer ocean affects atmospheric CO2 concentrations significantly"
Southern Ocean acidification via anthropogenic CO2 uptake is expected to be detrimental to multiple calcifying plankton species by lowering the concentration of carbonate ion (CO3-2) to levels where calcium carbonate (both aragonite and calcite) shells begin to dissolve. ... Southern Ocean wintertime aragonite undersaturation is projected to occur by the year 2030 and no later than 2038. In contrast, there is a simultaneous anomalous uptake of anthropogenic CO2 during a positive phase of the SAM in the southernmost regions of the Southern Ocean, due to increased upwelling of deep, older waters and their subsequent exposure to higher atmospheric CO2 levels. The anthropogenic uptake only slightly mitigates the natural outgassing from the Southern Ocean, so that a positive SAM is associated with anomalous outgassing of contemporary CO2. In a future characterized by higher atmospheric CO2, however, positive phases of the SAM may be associated with a greater oceanic uptake of anthropogenic CO2. And they say clouds are complicated beasts? Ah, I see your problem. The simple (probably non-informative answer) answer is that the ocean is heterogeneous. Depending on where you are it can be a source or a sink for CO2. What increasing atmospheric CO2 concentration has done is to shift that balance uniformly toward the sink side of things. Still, there are large areas where upwelling of deep, CO2 rich water and limited phytplankton growth (often due to relatively low Fe availability) results in surface waters that are supersaturated with CO2. This is particularly true in the Eastern Equatorial Pacific because the cold CO2-rich waters warm significantly after reaching the surface, making them even more supersaturated. It's the largest natural source of CO2 on the planet. In the Southern Ocean things are more complicated because the deep water upwells vigorously there and can be subducted beneathe warmer, light water after moving northward, or can sink to great depths if it gets particularly cold and salty after moving south. I need to read the paper when I have time, but the quote you cite seems to have something to do with the fact that under positive SAM and steady state CO2 conditions, vigorous upwelling brings CO2 rich water continually to the surface where it can lead to net evasion of CO2 on the whole. However, in some places there may net uptake of CO2, or net evasion depending on initial CO2, the evolution of water temperature and mixing with surrounding waters. Under higher atmospheric CO2 levels, though, the net flux would be into the ocean across the Southern Ocean because, while the atmopsheric concentration is changing, the concentration in the upwelled water stays constant because it reflects past atmospheric conditions 200-1000 years ago. If that difference is high enough, then the same vigorous upwelling during SAM could actually enhance net storage of CO2 by continuously bringing new undersaturated water to the surface across the entire region where it can soak up CO2 and then sink to depth again. "stop speculating about processes you do not understand"
Thanks for answering my question. In reading 41, 42, 43, and 44 it becomes clear that the problem is not simple. Muoncounter - How is it possible for oceans to simultaneously absorb and emit CO2? The temperature of the ocean is heterogeneous too. Generally the flux of CO2 to the atmosphere originates from the tropical regions where the ocean is warmer and CO2 less soluble. The uptake is occurring in the larger region of cooler waters where CO2 is more soluble. Much more complicated than that of course, as others have already pointed out, but why over-complicate matters?. The overall effect of human fossil fuel combustion is to increase CO2 dissolved into the oceans at a rate that is unprecedented. The Arctic Ocean is projected to reach aragonite (more soluble form of calcium carbonate) undersaturation within a decade, meaning the waters will be corrosive to calcifying marine organisms that make their shells from aragonite. "Aragonite undersaturation in Arctic surface waters is projected to occur locally within a decade and to become more widespread as atmospheric CO2 continues to grow. The results imply that surface waters in the Arctic Ocean will become corrosive to aragonite, with potentially large implications for the marine ecosystem, if anthropogenic carbon emissions are not reduced and atmospheric CO2 not kept below 450 ppm." It amazes me how little attention is being given to such a serious issue. It will have profound effects for life on Earth, and the changes to ocean chemistry are pretty much irreversible for many ten of thousands of years. Muoncounter - "How is it possible for oceans to simultaneously absorb and emit CO2?" Actually a simple source of confusion may be the separation of natural and anthropogenic CO2 that is made the Luvenduski paper. 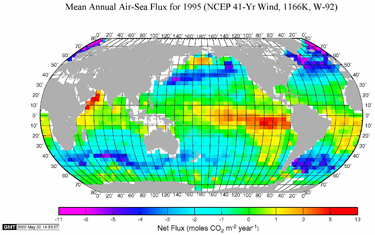 It helps to know that net flux of CO2 into the ocean really reflects the balance between CO2 influx and outflux, just like temperature of the ocean reflects a net energy balance. So there can be a net flux of anthropogenic CO2 in (as all of it is in the atmosphere), but a net total flux of CO2 out due to local imbalances between pCO2 in water and air. It can be hard to parse that out in words without being confusing, as that text you quote makes quite clea! But fig 3 does a good job. The complex pattern of "natural" CO2 influx and outflux (Fig 3b)reflects upwelling of CO2 rich water, temp changes, downwelling (well constrained) as well as sea surface exhange and phytoplankton growth/sinking (both less well constrained) on the CO2 balance. The contemporary pattern differs in that influx of CO2 has increased regionwide due to anthorpogenic CO2. The spatial pattern of that increase is shown in Fig3c. That's the shift toward sink state I mentioned. One big unknown in all of this is if the biological pump in this region may respond to changing CO2 in this region. People are working on various aspects of that as we speak. As for whether clouds are trickier than oceanic CO2 exchange, you'd have to say the Luvenduski paper does an outstanding job of reproducing the mesocale SST variability across the Southern Ocean (fig 2). I have pretty good confidence in their prediction of the underlying physical variables that largely constrain CO2 flux. Clouds are WAY more difficult, I think. Lovenduski's Fig 4 captures in time series format the changes going on south of 35S latitude. For 'natural flux', the trend turned from - (sink) to + (source) in the mid 80s; a warming sign? But when she adds in 'anthropogenic' to create the 'net flux', the long term trend is driven downwards towards a stronger sink. Hence this patch of southern ocean is, on balance, soaking up CO2 and acidifying. So anyone who says 'atmospheric CO2 increase is solely due to ocean outgassing' is all wet. Glad someone has the patience and time to post those images! "So anyone who says 'atmospheric CO2 increase is solely due to ocean outgassing' is all wet." On that we should be able to agree. Physical and chemical considerations as well the evidence from stable isotopes, physical measurements, times series of pH and pCO2 pattern/trends are in agreement and unequivocal.